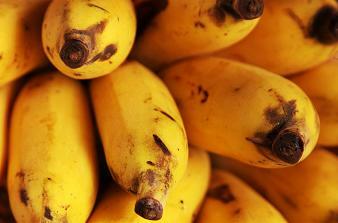 Can Bananas Make You Fat? You have probably heard dietitians talking a lot about how bananas are one of those fruits you should avoid especially if you are on a weight loss diet because of the high sugar content. I know a lot of people who became afraid to eat bananas because they were made to believe that bananas will make them fat. And while it is true that bananas are high in sugar, they can only promote weight gain if you are not careful with how many calories you eat and combine them with fats. I know fruitarians who only eat fresh fruit and maintain ideal body weight – they have the most fitness and tone, in spite the fact that they eat dozens of bananas every week. The secret is that they don’t load themselves with fatty foods, which accumulate into fat cells when you combine them with sugary foods such as bananas. So it is safe to say that if you control your fat intake you may enjoy this delicious fruit without feeling guilty or gaining weight. In fact, by including this fantastic fruit into your diet you will improve your digestion, remove excess toxins and make your skin glow. There are so many amazing benefits of bananas, that it is difficult to summarize them all in few sentences. Aside of being loaded with potassium, B vitamins and magnesium they contain no fat or cholesterol. They are good for your heart and bones, your nervous system and kidneys; they can improve your mood and boost immune system. Banana weight loss diet is a delicious and fast way to shed extra pounds without having to eat boring and tasteless foods. Bananas can help produce serotonin in your body which is also known as ‘happiness hormone’. So you will not feel any blues while staying on a banana diet and that’s a key element of any successful diet. If you hate what you eat, your body will resist that food and refuse to absorb nutrients from what you feed it. On the other hand, if you enjoy your meals, and feel happy and easy with your foods, the fat will just melt away, giving you a feeling of inner strength and energy. It is very easy to follow the banana diet. It only lasts 3-4 days and you can lose up to 8 pounds. For the next three to four days eat 3-5 bananas each day combining them with 3-4 cups of low fat milk. If you don’t like the milk, you may try almond milk that becomes very popular lately. You can also try plain yogurt if you like. You can eat them separately of make a smoothie. Just blend one banana and one cup of milk with few ice cubes together and you are done. If you freeze your bananas for few hours before blending them with milk, you will get a delicious ice cream. What a great treat on a hot summer day! This 3-4 day diet will help you get rid of up to 6 pounds of body weight. This version of banana diet can make you up to 8 pounds lighter. Not only it will help you lose weight, but also do a mild natural cleanse. All you need are bananas, green tea and two eggs. After completing this diet, make sure you gradually return to your normal eating habits to avoid the yoyo effect. Allow yourself 2-3 days to recover. Avoid eating processed or fat foods, sugar or alcohol. Start with fresh vegetable and fruits, slowly introducing the variety of foods and increasing the size of your meals. Enjoy and don't forget to exercise - join yoga weight-loss challenge to complement this diet!